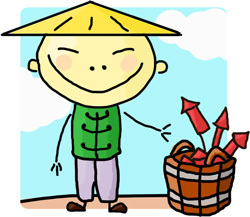 The earliest documentation of fireworks dates back to 7th century China. They were invented more than 2000 years ago in China. In 1240 the Arabs acquired knowledge of gunpowder. A Syrian named Hasan al-Rammah wrote of fireworks using terms that suggested he derived his knowledge from Chinese sources. 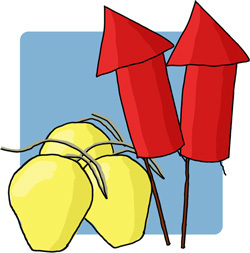 The first recorded fireworks in England were at the wedding of King Henry VII in 1486. Dreaming about fireworks means that you like to be the centre of attention and are showing off to others. It also symbolizes enthusiasm and exhilaration. 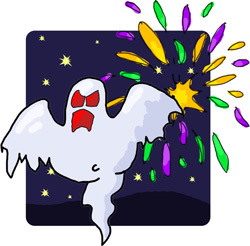 The fireworks were used to accompany many festivities, scare off evil spirits and promote prosperity. The largest chocolate firework was measuring 3m high and 1.5m in diameter and containing 60kg of Swiss Cailler chocolates. The firework was released in Zurich on New Year's Eve 2002. Fireworks are not fun for animals. Always keep dogs and cats inside the house when fireworks are being let off. Stay calm and make sure they have somewhere to hide. The biggest occasion for fireworks in the UK is Guy Fawkes Night (5th November). It is a celebration of the failing of the Gunpowder Plot on 5 November 1605, an attempt to kill King James I at the Houses of Parliament. The largest firework rocket is 13kg and was produced and launched in Portugal in 2010. Queen Elizabeth was so fascinated with fireworks that she created an honorary title, "Fire Master of England" for the individual who created the best fireworks. The word for firework in Japanese, 'hanabi', which actually means "fire-flower". Amédée-François Frézier published a "Treatise on Fireworks" in 1706, covering the recreational and ceremonial uses of fireworks. The book became a standard text for fireworks makers. A rocket can reach speeds of 150mph, however the shell can reach as high as 200 metres. A sparkler burns at a temperature over 15 times the boiling point of water. 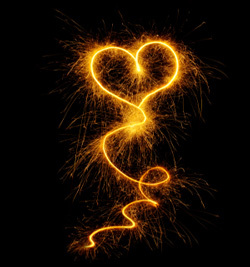 Three sparklers burning together generate the same heat as a blowtorch. When your sparkler goes out, put it in a bucket of water. The record for the largest firework display consisted of 66,326 fireworks and was achieved in Portugal in 2006. Static electricity in synthetic clothing can set off firecrackers. People making firecrackers wear only cotton clothing while making firecrackers. Italy was the first country to truly master and experiment with fireworks in Europe. They were the first to use shells for firecrackers to be loaded into canons and shot into the air. Half of all firework injuries are to children under the age of 16. The biggest annual fireworks display event in Europe is the International Festival concert held in Edinburgh, Scotland, in which a million fireworks are set off in less than an hour. Sparklers can be used to make funny pictures. All you need is a totally dark setting, a sparkler to draw with and a camera recording a long exposure. A record breaking 56,000 firework rockets were launched simultaneously in a spectacular opening to the Plymouth, UK Fireworks Championships by Scientist Roy Lowry. A string of firecrackers that went on and on lasting 22 hours marked the New Years day celebrations in Hong Kong in 1996.